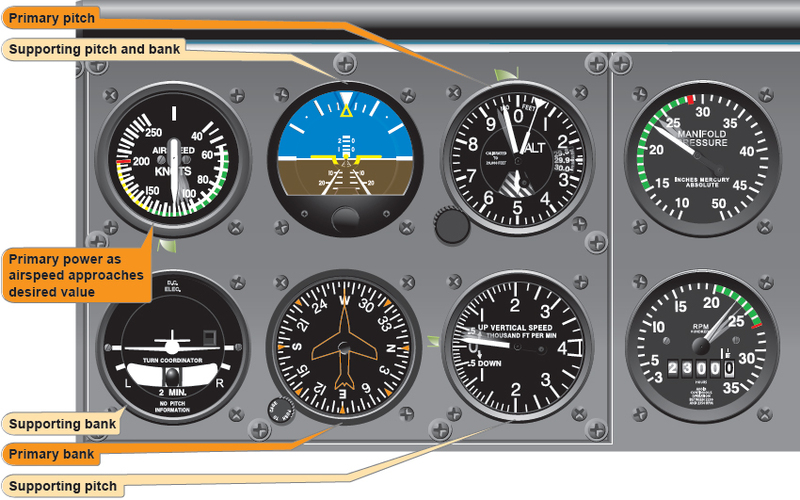 Once the airplane stabilizes at a constant airspeed and attitude, the ASI is primary for pitch and the heading indicator remains primary for bank. [Figure 7-26] Monitor the tachometer or manifold pressure gauge as the primary power instrument to ensure the proper climb power setting is being maintained. 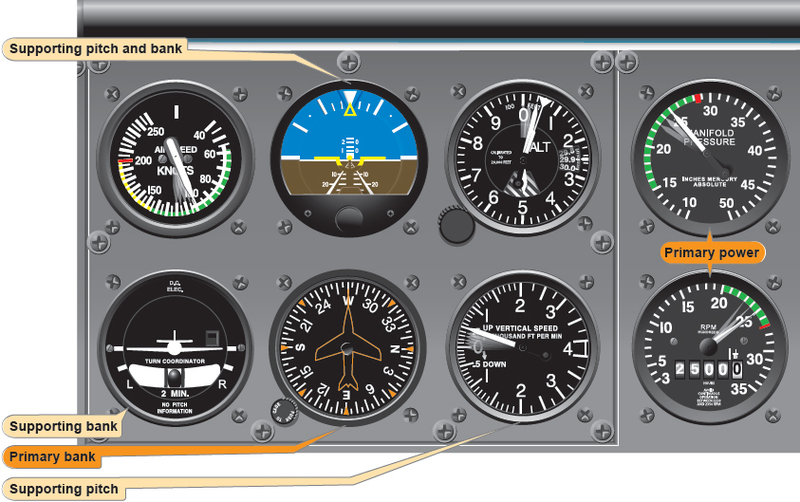 If the climb attitude is correct for the power setting selected, the airspeed will stabilize at the desired speed. If the airspeed is low or high, make an appropriately small pitch correction. To enter a constant airspeed climb, first complete the airspeed reduction from cruise airspeed to climb speed in straightand- level flight. The climb entry is then identical to entry from cruising airspeed, except that power must be increased simultaneously to the climb setting as the pitch attitude is increased. Climb entries on partial panel are more easily and accurately controlled if entering the maneuver from climbing speed. Pitch and power corrections must be promptly and closely coordinated. For example, if the vertical speed is correct, but the airspeed is low, add power. As the power is increased, the miniature aircraft must be lowered slightly to maintain constant vertical speed. If the vertical speed is high and the airspeed is low, lower the miniature aircraft slightly and note the increase in airspeed to determine whether or not a power change is also necessary. [Figure 7-28] Familiarity with the approximate power settings helps to keep pitch and power corrections at a minimum. Figure 7-28. Airspeed low and vertical speed high—reduce pitch. To level off from a climb and maintain an altitude, it is necessary to start the level off before reaching the desired altitude. The amount of lead varies with rate of climb and pilot technique. If the airplane is climbing at 1,000 fpm, it continues to climb at a decreasing rate throughout the transition to level flight. An effective practice is to lead the altitude by 10 percent of the vertical speed shown (500 fpm/ 50-foot lead, 1,000 fpm/100-foot lead). To level off at cruising airspeed, apply smooth, steady forward-elevator pressure toward level flight attitude for the speed desired. 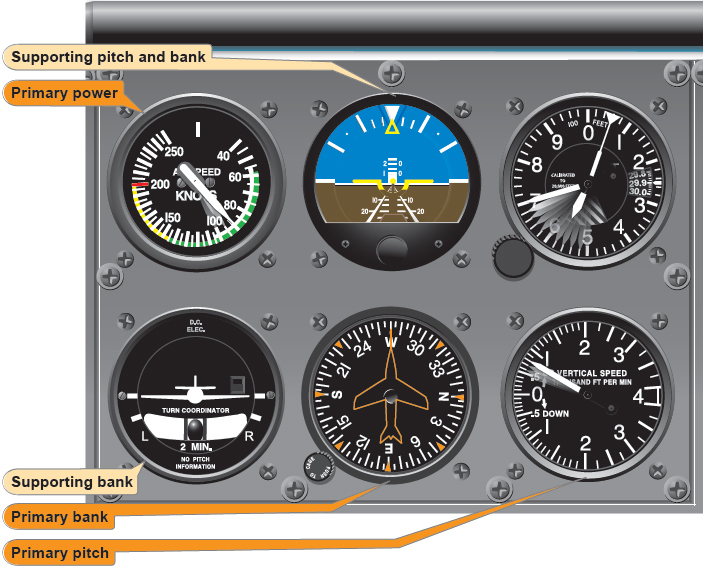 As the attitude indicator shows the pitch change, the vertical speed needle moves slowly toward zero, the altimeter needle moves more slowly, and the airspeed shows acceleration. [Figure 7-29] When the altimeter, attitude indicator, and VSI show level flight, constant changes in pitch and torque control have to be made as the airspeed increases. As the airspeed approaches cruising speed, reduce power to the cruise setting. The amount of lead depends upon the rate of acceleration of the airplane. To level off at climbing airspeed, lower the nose to the pitch attitude appropriate to that airspeed in level flight. Power is simultaneously reduced to the setting for that airspeed as the pitch attitude is lowered. If power reduction is at a rate proportionate to the pitch change, airspeed will remain constant.